Free Fletching By Hand plans - How to fletch arrows by hand. 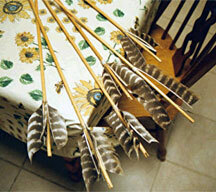 I started to make my own arrows just about the time I finished my first primitive bows. This may conjure up an image of a guy with a new bow, looking at it and scratching his head. That was about how that happened. I had the weapon, but I was missing the ammo! It probably happened just like that back in the Stone Age!